The annual Baja Ha-ha — the largest off-shore rally on the West Coast — departs San Diego on Monday for Cabo San Lucas, Mexico. 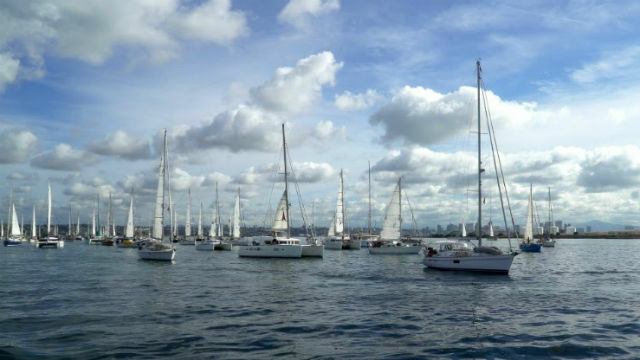 About 200 sailing yachts will kick off the event with a colorful maritime parade that begins off Shelter Island. The Harbor Police will conduct a water display with lights and sirens at 9:50 a.m., and a traditional starting gun send-off from a historical America’s Cup starting gun will mark the start of the parade. Port of San Diego Board Chairman Robert “Dukie” Valderrama, Coast Guard Captain of the Port Joseph Buzzella, Port of San Diego CEO Randa Coniglio, Harbor Police Acting Chief Mark Stainbrook, Mexican Consul General Marcela Celorio and Mexico Tourism Board Chairman Jorge Gamboa will be among the many officials aboard the parade’s lead boat, the Dolphin. Baja Ha-ha is organized and sponsored by Latitude 38 Magazine. Other sponsors include the Port of San Diego, the Sportfishing Association of California and the Consulate General of Mexico in San Diego.